Pushbullet added two small, but useful, new features this morning. 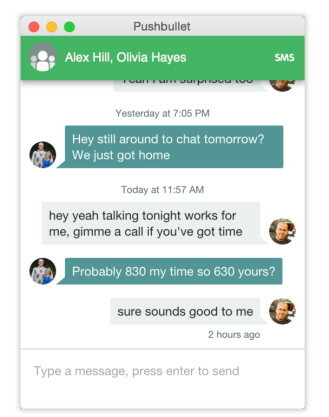 First, replying to group SMS from a computer or tablet is now (finally) supported. In a small gesture of holiday goodwill, Pushbullet won't count group SMS messages against the 100 message limit for non-paying users for the rest of the month. Group texting is now available through Pushbullet's Chrome extension, Windows desktop app, and Pushbullet's website. Support for Safari, Opera, and Firefox is coming soon.